According to Adform, the Ads.txt adoption has moved rapidly from 30% in October 2017 to above 75% in January 2018. 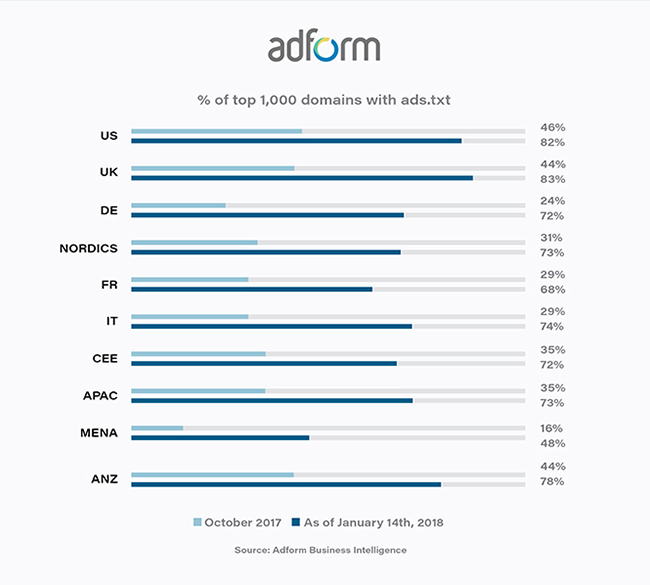 In October Adform shared preliminary figures on ads.txt adoption among the world’s top 1,000 publishers across global markets. At the time, adoption was just beginning to ramp up. Since then, they have continued to track the implementation of ads.txt while working aggressively with publishers to support their implementation and the result has been dramatic. Effective immediately Adform has begun filtering based on ads.txt across their Demand Side Platform for inventory sourced from all connected Supply Side Platforms including the Adform SSP. From the end of January the Adform SSP will exclude requests from sellers not listed in publishers’ ads.txt file to further clean up the supply path. Enabling ads.txt within the SSP provides an additional layer of filtering to prospective buyers purchasing inventory through the Adform SSP, even if external DSPs currently lack an ads.txt implementation of their own. According to the IAB’s Tech Lab who are the originators of the Ads.txt initiative, “The mission of the ads.txt project is simple: Increase transparency in the programmatic advertising ecosystem. Ads.txt stands for Authorized Digital Sellers and is a simple, flexible and secure method that publishers and distributors can use to publicly declare the companies they authorize to sell their digital inventory. The record serves as a key tool in identifying, tracking, and preventing inventory fraud/counterfeiting which undermines publisher brand value while depriving them of valid impressions and simultaneously results in advertisers potentially paying a premium for fake or misleading impressions. This makes ads.txt fundamentally about enhanced transparency in the industry, and a more clear insight into exactly what’s going on that offers key advantages for advertisers, publishers and transparency-focused technological providers like Adform. We have already been able to use ads.txt data alongside our existing internal anti-fraud solution to help us track and terminate a number of sophisticated fraud attempts including the recent unmasking and shut down of HyphBot. This would make ads.txt adoption seem to be a no-brainer for quality focused industry players. However, implementing ads.txt requires simple, but key structural changes for publishers who not only need to add an ads.txt to their source domain but need to carefully specify authorized sellers. Back in October when we ran our initial figures, adoption was just starting to hit critical mass with the US, one of the world’s most sophisticated programmatic markets, closing in on 50% adoption. Other markets, particularly those with less sophisticated programmatic markets lagged behind. Fast-forward to mid-January 2018, and it is clear that not only has adoption hit its stride but that we are seeing universal pickup which is rapidly accelerating. More than that, three out of every four of the top 1,000 publishers are now ads.txt enabled meaning we have crossed an important threshold in adoption and reached critical mass. For advertisers, this means the ability to buy with ads.txt enhanced confidence is now a practical reality. The doubling of adoption since October across the board also highlights the high level of interest we are seeing across all premium publishers and clear evidence that ads.txt has catapulted from concept to implemented industry standard. If you have run into widely different figures around ads.txt adoption and are confused, don’t worry – you are not alone. The source of this confusion stems from a lack of clarity on what is being compared, not a lack of alignment on the results. The adoption rates included in this post are for the top 1,000 publisher sites selling advertising and as such, those who should have an ads.txt file. This is different from pulling a list of the top 1,000 websites (in general). While a huge percentage of sites on the web are advertising centric or driven, there are still many which are not. These sites are not selling advertising programmatically and as a result, don’t require an ads.txt file. Failing to filter these sites undermines the integrity and value of the end data as it makes generating a clear and representative number challenging. Effective immediately, ads.txt filtering is active in the Adform DSP. The Adform SSP will follow from the end of January and exclude all publishers who have not implemented an ads.txt file. This further realizes the potential of ads.txt to deliver the cleanest and most transparent possible digital advertising supply chain. The use of ads.txt data is part of our multi-faceted anti-fraud strategy dedicated to delivering transparent and reliable tools for the market. In addition to being one of the only DSPs to secure MRC Accreditation for Display and Video impression and viewability measurement, Adform is one of the first advertising technology providers to secure TAG’s Certified Against Fraud seal via independent audit. The combination of these leading industry certifications paired with advanced internal reporting and native anti-fraud tools, bolstered by our ISO/IEC 27001 certification for Information Security Management raises the bar for the industry.